Warm bread with freshly spread butter, melting in your mouth. And you feel good because you know, even though no one else can tell, it’s sourdough, and that means that it contains more readily available nutrition than traditional breads. What better recipe, than a classic favorite, to add to your repertoire? This gluten-free, sourdough banana bread is a simple recipe, easy to make, and delicious! 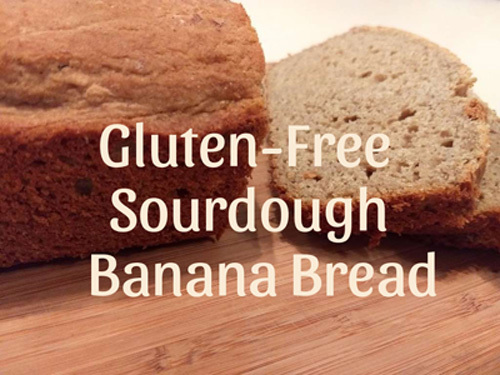 To download the PDF of this recipe, click this link: Gluten Free Sourdough Banana Bread. I am all about eliminating unnecessary sugar from my family’s diet. I use stevia in conjunction with traditional sweeteners to reduce our overall sugar load. This recipe gives you options, if you’re working the sugar out of your diet. Combine your wet and dry ingredients. Cover and allow to ferment for 7-12 hours. Preheat oven to 350 degrees. Place baking dish in oven to heat while you finish your batter. 1 loaf pan, bake for 50-55 minutes. 9×13 inch cake pan, bake 20-25 minutes. Banana bread should be firm, lightly browned, and a toothpick inserted into the center should come out clean. After baking, like most breads, allow to rest several minutes before slicing. * This recipe uses honey for its sweetness and its moisture. Sugar will work, but it will result in a more dry loaf. Traditional banana bread recipes use 1 cup of sugar per loaf. For similar sweetness, use 1/2 cup of honey (8 TBS) with 1/4 tsp. stevia. If you are in the process of reducing your sugar intake, try 1/3 cup of honey (5 TBS) with 1/4 tsp. stevia. If you are already accustomed to low sugar, you may enjoy 1/4 cup (4 TBS) of honey with 1/4 tsp. stevia, or adjust to your individual preference.